The largest shopping mall in Bulgaria’s Black Sea city of Varna, Grand Mall Varna, will be formally opened ahead of schedule, on Thursday, May 27, 2010. The early opening of the complex was announced Wednesday at a special news conference by the real estate developer and investor, Orchid Developments Group, and two of the major tenants, the international retail giant Carrefour, and Alexandra Group Holding, a Bulgarian operator of the Arena movie theaters. The construction of Grand Mall Varna started in 2007, and over EUR 120 M have been invested in the complex so far. The biggest mall in Varna has a total built-up area of over 150 000 square meters, including 50 000 square meters of commercial space for rent. It features a parking lot with 1 700 spaces. The Arena movie theater inside it has 8 halls will a total of 1 100 seats. The decision to open the mall earlier than planned has resulted from “the unprecedented trust of the tenants with respect to the high-quality services of Grand Mall Varna, and their desire to take benefit from the start of the summer tourist season," in the words of the investors. “We have complied with the wishes of our tenants who expressed their trust in the huge potential of the city, and decided to open Grand Mall Varna ahead of schedule. This is good not just for our tenants but for the people of Varna as well. Our mall will feature the only Carrefour hypermarket in Varna, an Arena movie theater, top brands from the portfolio of Spanish company Inditex Group (ZARA, Bershka, Pull and Bear, Stradivarius), as well as many other Bulgarian and international firms. Many of them are entering the Varna market for the first time which demonstrates their trust for Orchid Developments as an investor,” stated Eli Egosi, advisor to the CEO of Orchid Developments Group and a partner in the Grand Mall Varna project. “I believe that the synergy between Europe’s leading retailer Carrefour and the other strong brands will contribute to the success of Grand Mall Varna. By investing in our first hypermarket in Varna, we are assuming our responsibility for the development of the local economy and the improvement of the quality of life in the region. Carrefour’s entire philosophy is based on the understanding that client satisfaction is our top priority,” said in turn Christian Charitat, CEO of Carrefour Bulgaria. “Grand Mall Varna has presented us with excellent opportunities to expand the presence of the Arena movie theaters in Varna. We are going to set up a special place where the residents and guests of Varna will be able to enjoy world cinema. Our goal is the complete the digitalization of the Arena movie theaters. The number of viewers in the 3D halls will continue to grow. Within just a year, the newest revolution in cinema has grown to such proportions that it is compared to the appearance of color films. We are happy that our movie theaters are among the first in Europe that are equipped to show the latest 3D blockbusters. We are happy that we can do this in Grand Mall Varna,” explained Stefan Minchev, President of Alexandra Group Holding, owner of the Arena cinemas chain. The global brands that are entering the market of Bulgaria’s major Black Sea city for first time thanks to Grand Mall Varna include not just Carrefour but also Zara, Bershka, Stradivarius, Pull and Bear, Humanic, Playlife, Calliope, Douglas, Bata, Deichmann, Intersport. The partners that took part of the realization of the Grand Mall Varna project include MYS Architects (a firm that participated in the construction of Mall of Sofia), Lagis EOOD, the OTP bank, the MKB Union Bank, the DSK Bank, leading real estate companies Colliers Properties and Colliers Leasing, law firms Firon-Bar-Nir and Eurolex, and Bulgaria’s largest PR agency M3 Communications Group, Inc. The real estate developer and hotel operator Orchid Developments Group Ltd is active in all major sectors of the Bulgarian real estate market. It operates projects in Sofia, Varna, and the Golden Sands resort. With over EUR 150 M invested in Bulgarian real estate properties, Orchid Group is one of the leading companies on the Bulgarian property market. In addition to the EUR 120 M Grand Mall Varna, the company has two more projects in Varna – the closed-type complex Orchid Hills and a mixed use building in the downtown, Orchid Gardens Varna. 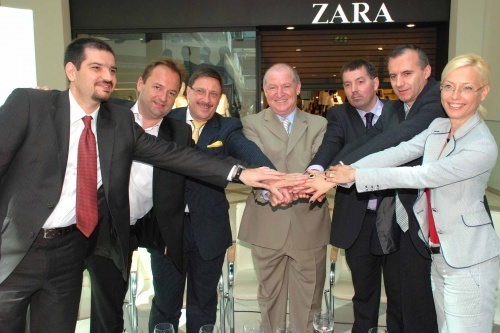 *In the photo - L-R - L-R: Atanas Garov, CEO, Colliers Bulgaria; Stefan Minchev, President, Alexandra Group Holding; Maxim Behar, CEO, M3 Communications Group, Inc.; Ely Egosi, Advisor to the CEO of Orchid Developments Group; Steven Cliever, Manager, Grand Mall Varna; Christian Charitat, CEO, Carrefour Bulgaria, Diana Borlakova, Marketing & PR Director of Carrefour Bulgaria.